The GT280 Jacky Tsunami was developed in cooperation with former Motocross World Champion Jacky Martens. 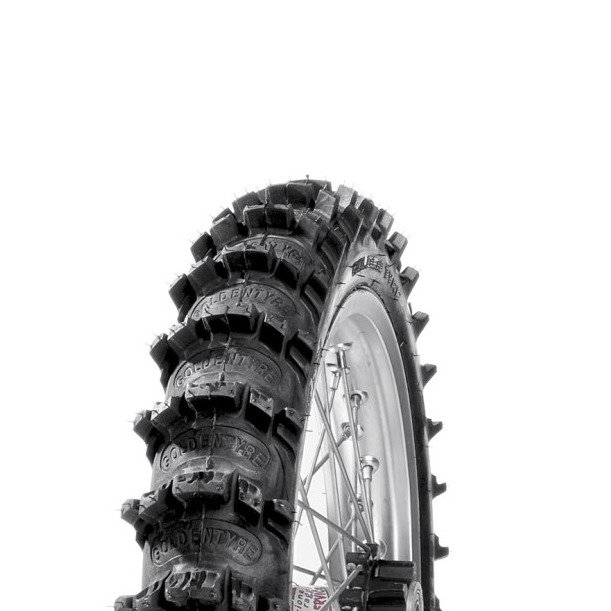 Years of testing and development in the sand tracks of Europe with Martens (who won 2 consecutive FIM 500cc World Motocross Championships) are what make the GT280 the ultimate sand and mud terrain tire. The Goldentyre GT280 features a shovel-shaped knob design that also facilitates the expulsion of sand / mud while using unique angles in the knobs to offer superior braking traction and steering feel. Designed for sand / mud conditions only, not to be used on hard pack terrain. For recommended mousses, please check our Minicross Mousse selection.